TankTops is a design and distribution company that specializes in decorative enclosures. These enclosures are designed to conceal large items in your yard and be utilized at the same time as a flower planter, bird bath or a bird feeder, and some may be used for children’s toys! TankTops is a small company just getting started in the industry. We are a home office currently based in Durand, WI. We started the design and patent process in the fall of 2013. At present, the company is owned and operated by its founders, Matt & Danielle Unser. We have been part of Unser excavating a family owned and operated company since 1986! With the landscaping of homes and businesses, we have a need to conceal several portions of customers yards. With that, we have developed this line of products! 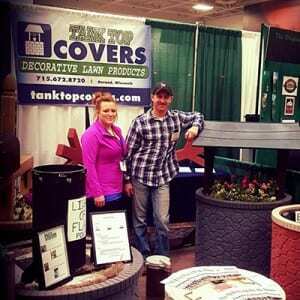 They can be utilized for concealing not only septic tank lids. Also well pipes and covers, used for sign bases, & hide small tree stumps! TankTops work great as a center piece for a rock garden or a flower garden! If standing alone, the TankTop cover can be weighted down inside the base with simply using a few block or stones. For a more permanent spot to be set up, the TankTop cover can be partially filled with sand/ dirt also to hold against high winds! We are always coming up with new ideas and designs! Check out the Youtube assembly and installation video! We are excited to see our products put to use in your landscape and invite you to email us pictures and comment. We also would like to see your unique ideas of using our products and would like to feature pictures of them in our gallery! !